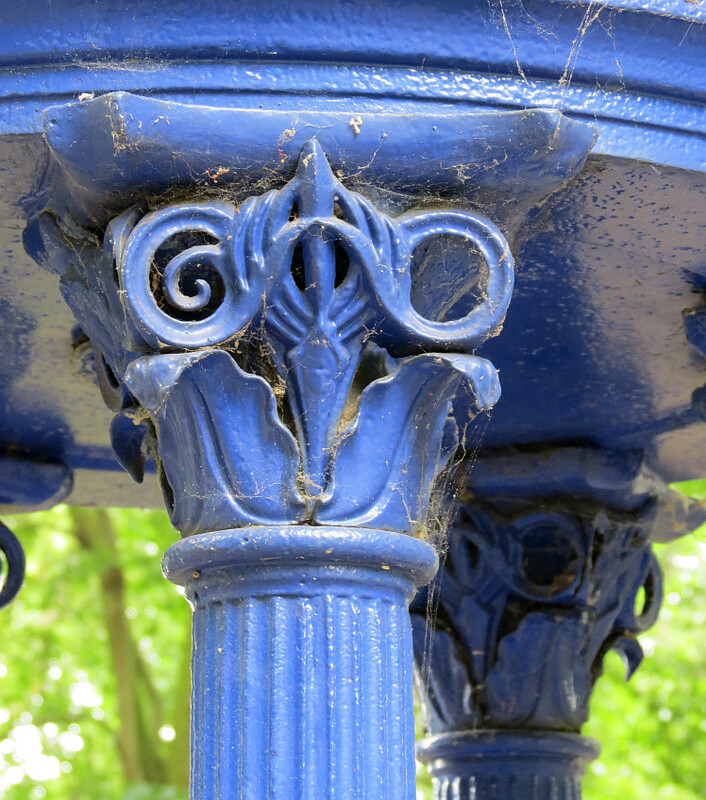 A Victorian structure near to King’s Cross St Pancras in central London, interesting more for its mosaics than its sculpture. 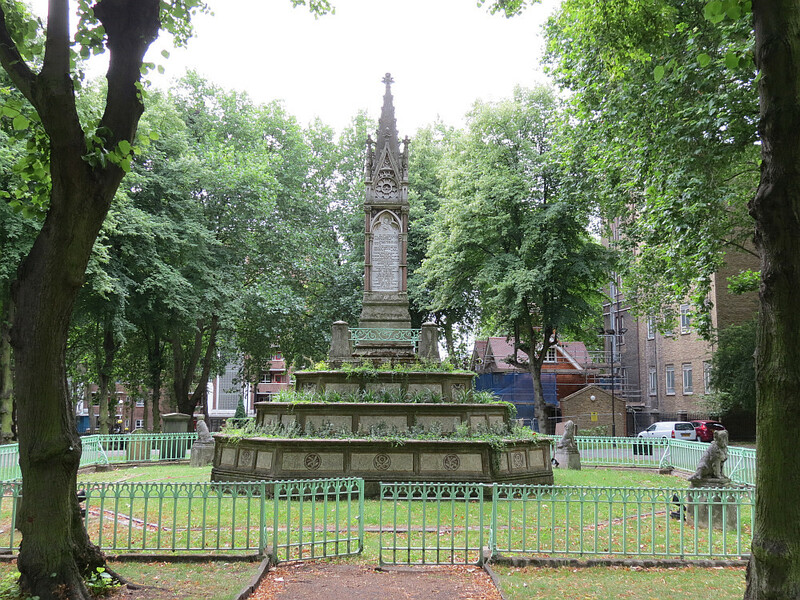 What a archetypical Victorian monument it is: a classic Victorian Gothic tower like some mini-Big Ben, with spires and roundels bearing relief sculpture, above a series of steps, with panels of mosaic, and surrounded by four free-standing statues of animals. 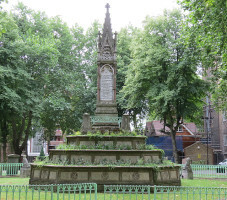 It was put up in 1879, to mark the conversion of Old St Pancras Churchyard, long closed, into a public garden, by Baroness Burdett-Coutts, the philanthropic heiress to the Coutts banking fortune. Among many good works, on this website is described her church, St Stephen’s Rochester Row, which also has mosaic decoration. 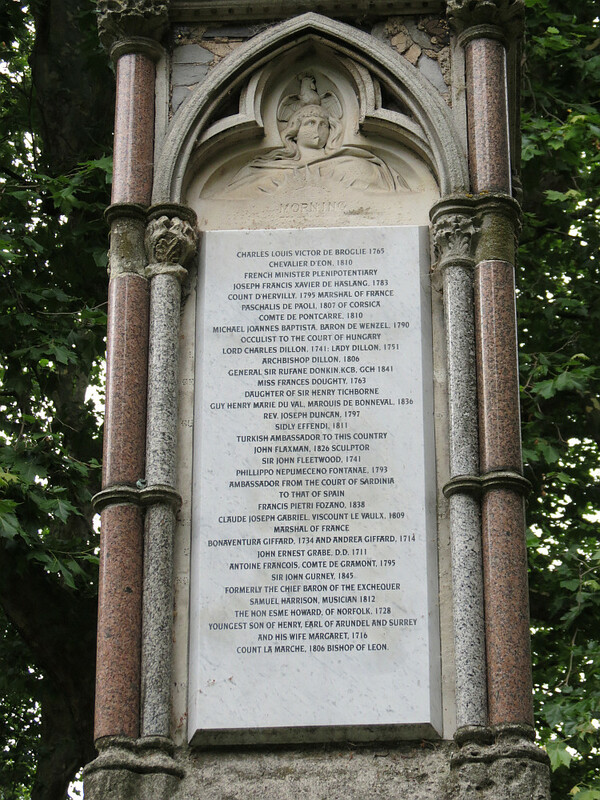 The architect of the St Pancras memorial was a certain George Highton, of Brixton, who rebuilt the church of St Mary at Cardington, Bedford, a mansion in West Norwood (later St Joseph’s College). 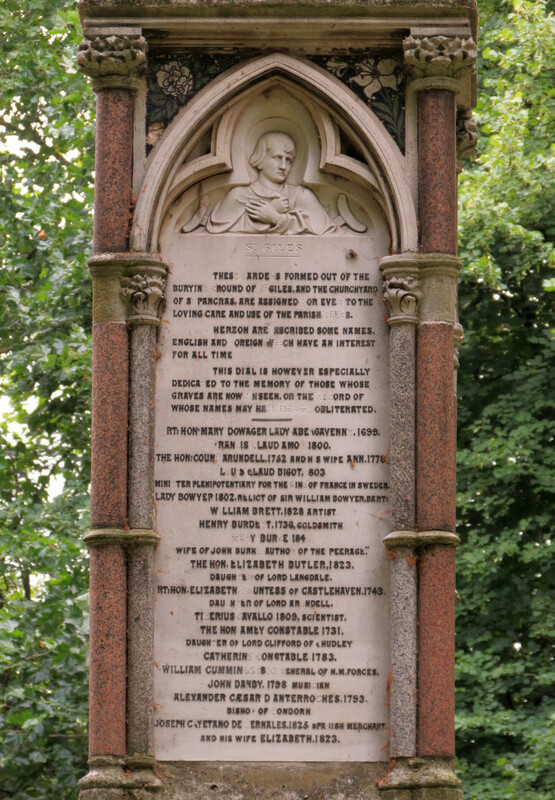 It is made of an interesting assemblage of different stone: Portland limestone in the main, including the spire and carving, base, and surrounding animal statues; red Mansfield sandstone for the steps, and grey Cornish granite and pink Shap granite, for the columns bordering the side panels; the inscribed panels are of course of marble. 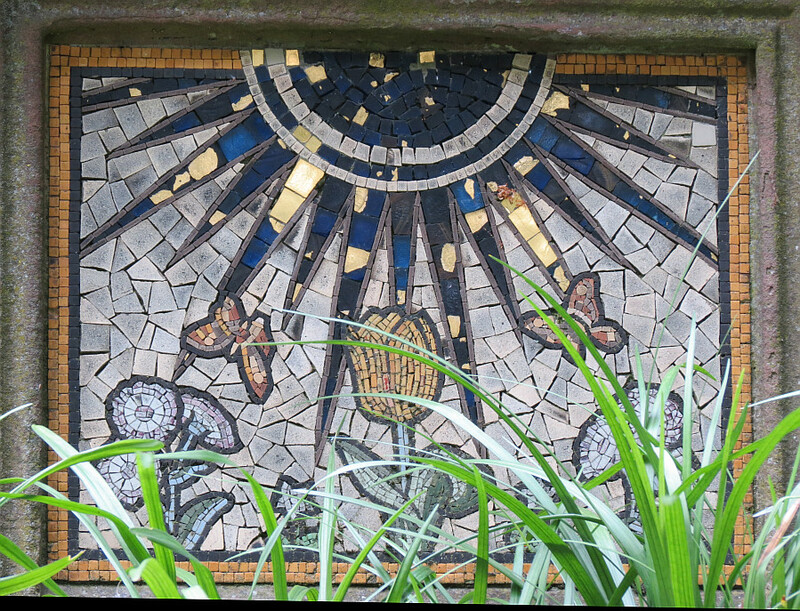 Sample mosaics from the Burdett-Coutts sundial steps . 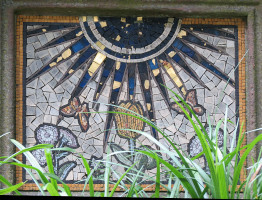 The mosaics are small panels, individually simple and measuring up as design rather than art, but collectively most visually effective. 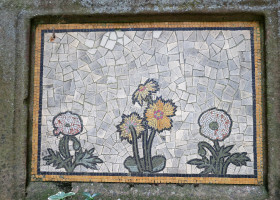 In each case, there are a number of plants, rendered in small mosaic pieces of various colours, with a border of black or dark mosaic in Italian style, and a background of much larger white mosaic, randomly shaped. 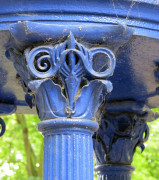 Again in Italian style, the pieces are fitted very closely together, with a minimum of mortar. 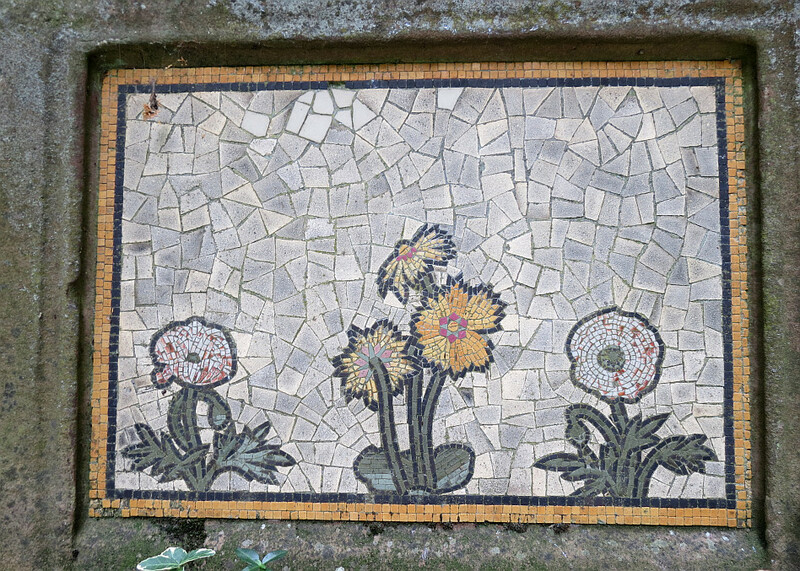 Time has not dealt kindly with the mosaics, and numerous pieces have fallen off, with the larger glazed pieces losing some of their glaze, presumably to winder freeze-thaw spalling. Even so, what remains is worthy, appropriately sized for the scale, stylised but with some naturalism to the poise of leaf and outline of the flower. Some of the panels have butterflies in them, elegantly composed with remarkably few individual mosaic pieces. 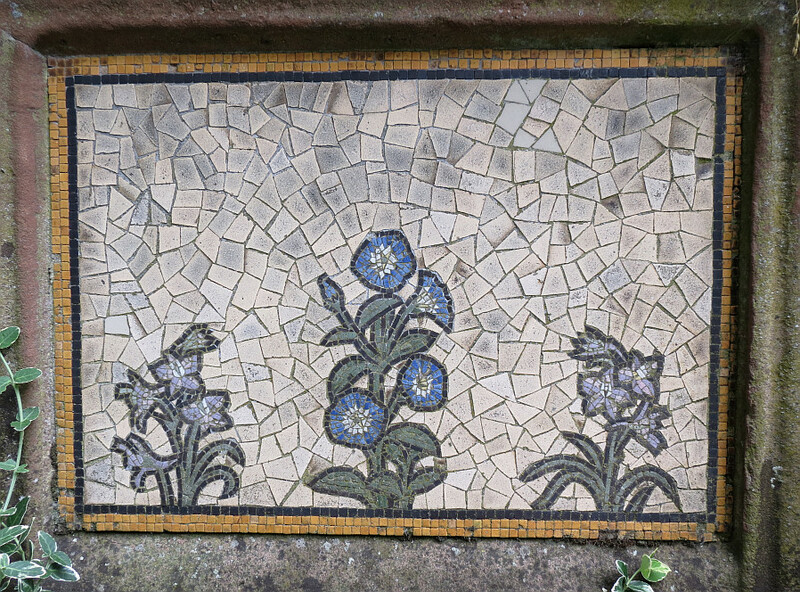 The lowest of the three steps has monochrome mosaic panels, with roundels containing stylised terra cotta plants. Panels to St Pancras, and to Morning . 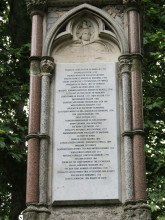 Higher up, the marble panels around the sides of the shaft of the little tower contain lists of some of those who were buried in St Pancras Churchyard, and some lines of poetry, and at the top of each panel is a trefoil Gothic arch, with relief carving within. 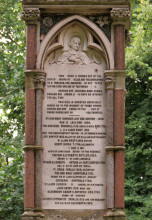 We have a bust of St Giles with his crutches, with well rendered hands but too-clean face, St Pancras as a child, more head and arm than a bust as an open book is in front of the body, and cloak and fernlike branch to the sides. 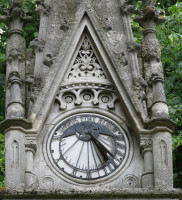 On the other two sides are Morning as a youthful figure with sun in front and a crowing cockerel perched on top of the head, and Night as a nun-like female with cowl and crescent moon in front of her chest. 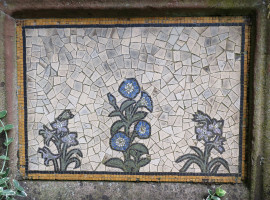 The spandrels above the Gothic arches contain further mosaic flowers; a single flower per spandrel, and thus larger and more complex in design than the panels down below. 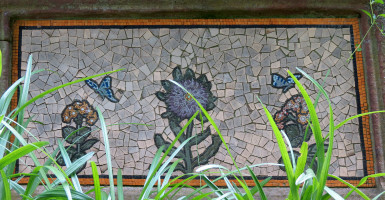 Some of the mosaics are missing. 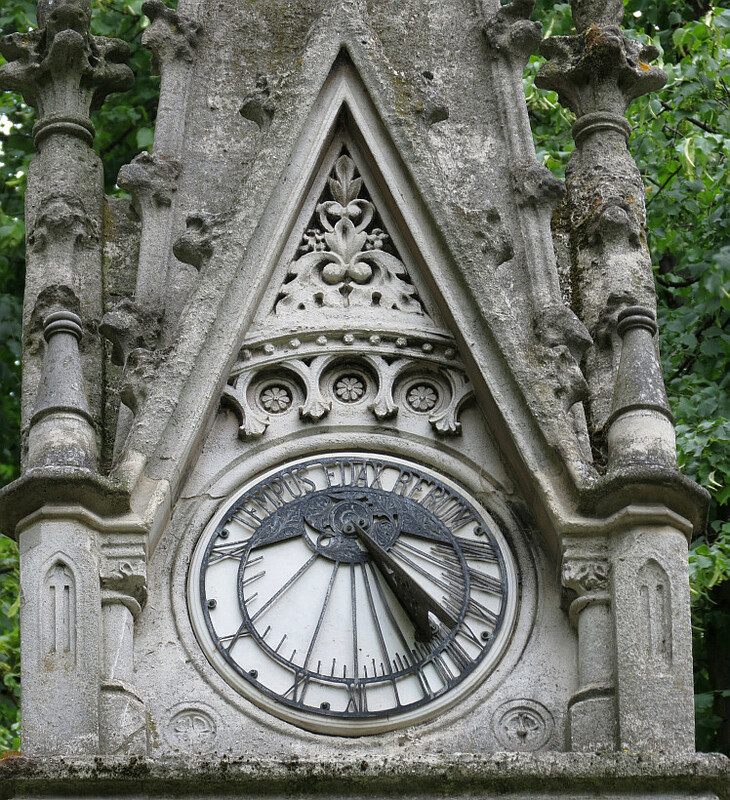 Above, the central spire, which is crocketed has four surrounding gables, bearing a sundial and blind windows, nicely carved and weathering picturesquely. 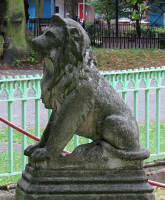 Two of the animal statues . 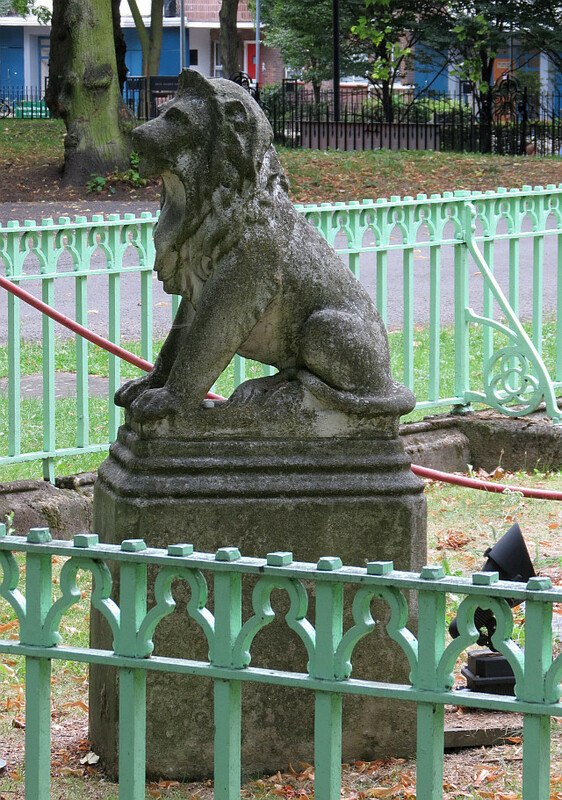 There are iron railings around the central shaft, and forming an enclosure around the monument as a whole, and within this latter space are placed four pedestals bearing lions and dogs, seated upright, but a little more naturalistically than heraldic beasts; one of the dogs is supposedly modelled from Baroness Burdett-Coutts' own animal. 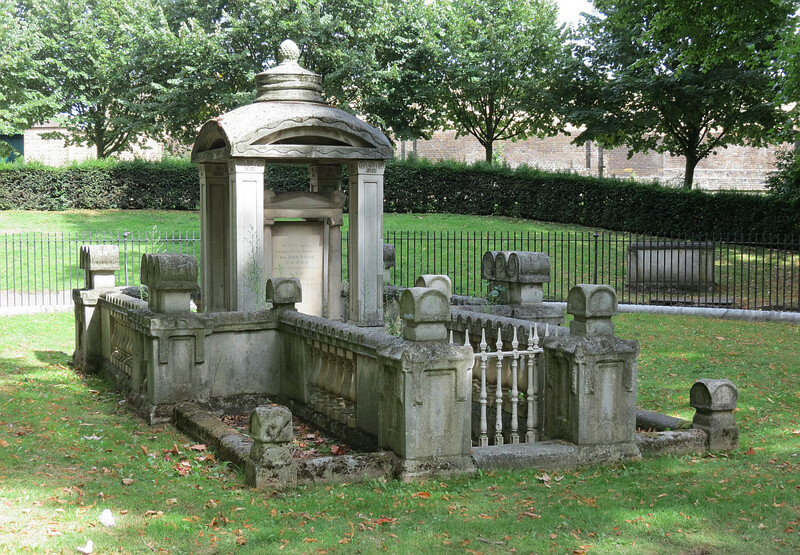 Weathered Portland stone, and with varying degrees of damage. 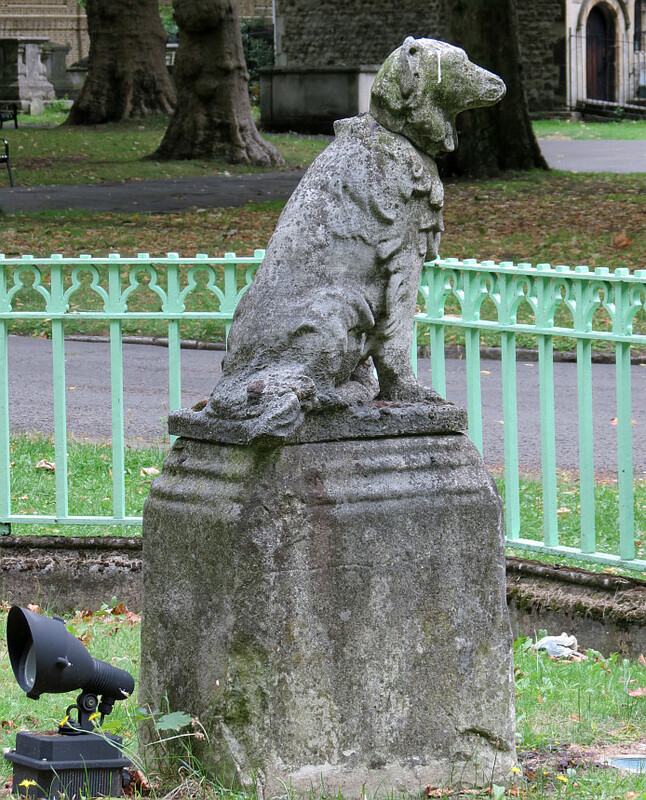 St Pancras Old Church . 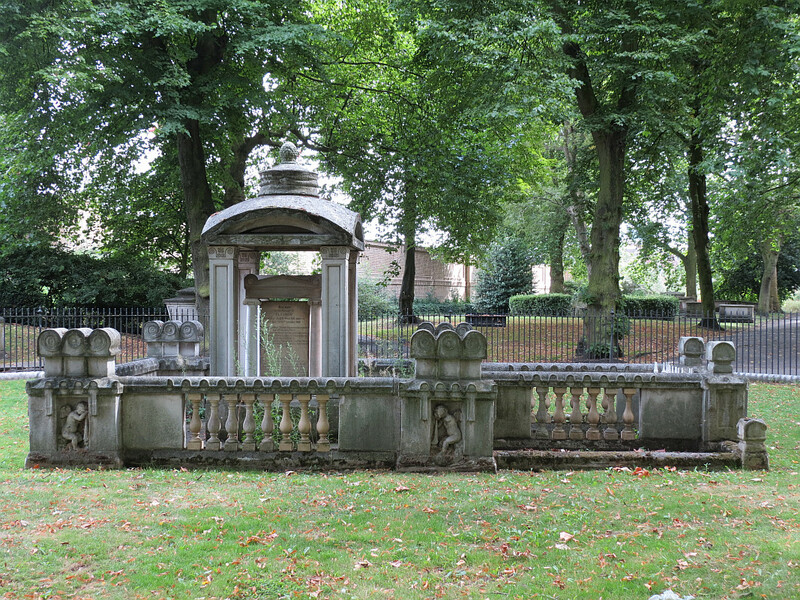 St Pancras Old Church is itself an interesting building with several significant monuments. 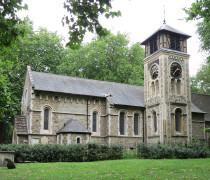 The Churchyard, with its tall Plane trees and somewhat enclosed by high brick buildings including an old Board School, has an ambience of its own. 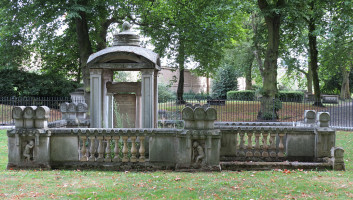 Among the trees are scattered a variety of chest tombs, of which the most important is the mausoleum to Sir John Soane, architect of the Bank of England, his wife and son. The central structure, with open cupola enclosing a smaller pillared structure, made of a series of Classical geometrically shaped pieces, is very Soanian, and it is enclosed with a low wallor balustrade with taller corner pieces, two of which still enclose winged cherubs; these latter, despite being in niches, are much battered, but we can still distinguish that they hold upturned torches, signifying of the snuffing out of life. 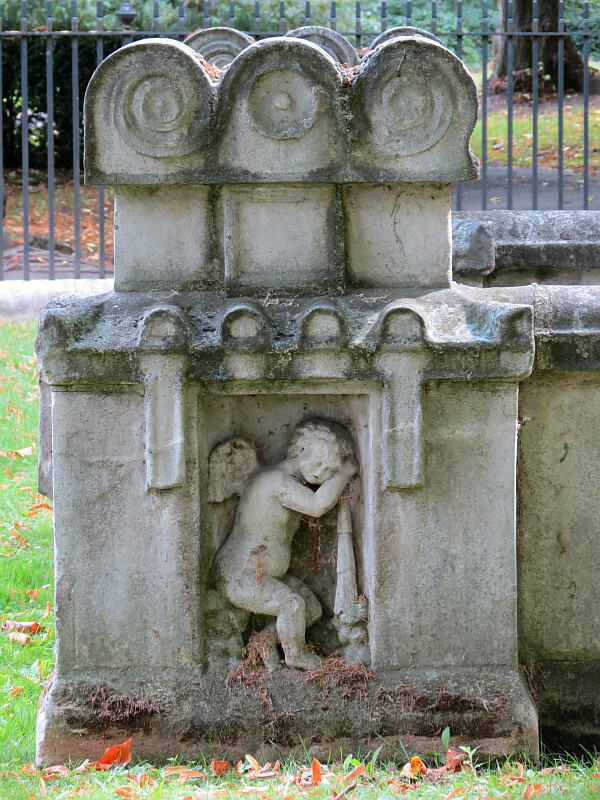 John Soane Memorial, Old St Pancras Churchyard . 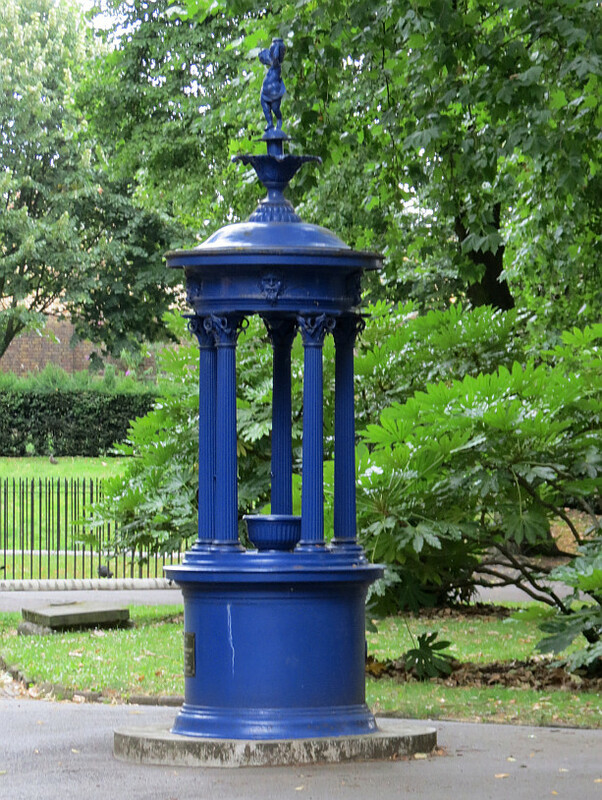 We may also note the cast iron fountain, painted blue, presented by William Thornton in 1877. 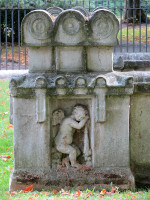 It is round, with outer Corinthian pillars supporting a cupola above the central bowl, and on top, a ghastly putto holding a pot; around the sides on what we might call the entablature are grotesque heads. 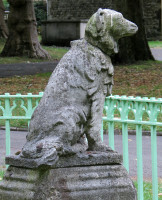 William Thornton fountain, Old St Pancras Churchyard . 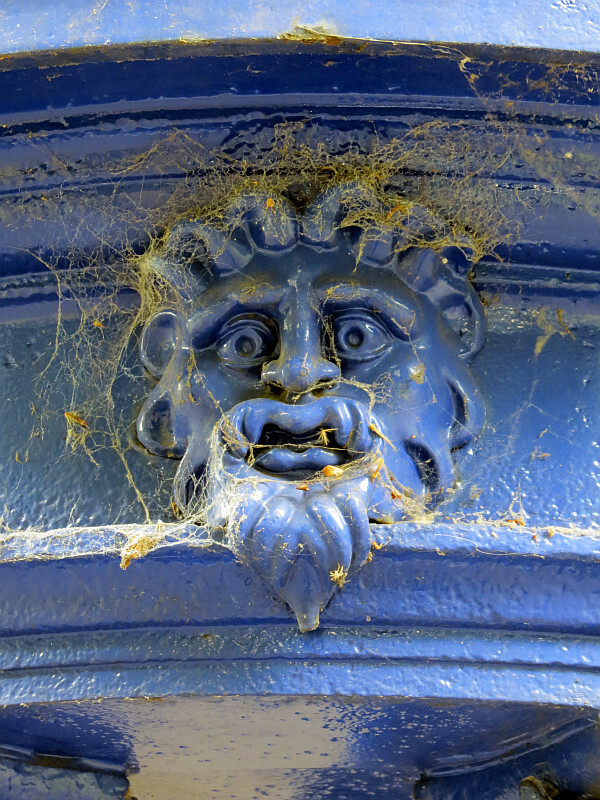 This page was originally part of a 'sculpture of the month' series, for Mar 2015. Although the older pages in that series have been absorbed within the site, if you would wish to follow the original monthly series, then jump to the next month (Apr 2015) or the previous month (Feb 2015). To continue, go to the bottom of each page where a paragraph like this one allows you to continue to follow the monthly links.